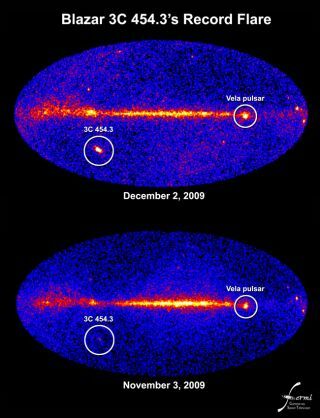 Unprecedented flares from the blazar 3C 454.3 in the constellation Pegasus now make it the brightest persistent gamma-ray source in the sky as of Dec. 2009. These all-sky images, which show the numbers of high-energy gamma-rays captured by Fermi's Large Area Telescope on Dec. 3 and Nov. 18, clearly show the change. A distant galaxy with a giant black hole in its center hasbeen acting up recently, emitting extremely bright flashes of gamma ray light. The flares began Sept. 15, making the galaxy currently thebrightest source of gammarays in the sky and boosting its own brightness to more than 10 times its regularluminosity over the summer. NASA's Fermi Gamma-ray Space Telescope has beenobserving the phenomenon to learn more about how such active galaxies work.Astronomers think this galaxy, identified as 3C 454.3, is what'scalled a blazar. Blazars, like many active galaxies, emit oppositely directedjetsof particles traveling near the speed of light when matter falls towardtheir central supermassive black holes. What makes a blazar so bright in gammarays is its orientation in space. One of the jets happens to be aimed straightat us, so it is easy to spot when viewed from Earth. "We're looking right down the barrel of a particle jetpowered by the galaxy's supermassive black hole," said Gino Tosti at theNational Institute of Nuclear Physics in Perugia, Italy. "Some changewithin that jet ? we don't know what ? is likely responsible for theseflares." This galaxy is located about 7.2 billion light-years awayfrom Earth in the constellation Pegasus. Despite its distance, it is currentlybrighter than the Velapulsar, a dense rotating star that is usually the brightest persistentsource in the gamma-ray sky. But at about 1,000 light-years away, the Velapulsar is relatively nearby in astronomical terms. "3C 454.3 is millions of times farther away, yet thecurrent flare makes it twice as bright as Vela," said Lise Escande at theCenter for Nuclear Studies in Gradignan, near Bordeaux, France. "That represents an incredible energy release, and one the source can't sustain forvery long." According to Massimo Villata at Italy's Torino Observatory, 3C 454.3 also isflaring at radio and visible wavelengths, if less dramatically. "In red light, the blazar brightened by more than twoand a half times to magnitude 13.7, and it is also very bright at high radiofrequencies," Villata said. The brightness of an object in the night skyis classified as its magnitude, with lower numbers referring to brighterobjects. The Fermi team is alerting other astronomers so they can monitor the event overas broad a range of wavelengths as possible. "That's our best bet forunderstanding what's going on inside that jet," Tosti said.